Most cats will spend a significant part of their day grooming. Domestic cat’s fur is generally made up of three types of hair: down, awn and guard. However, some pedigrees have their coats made up of a different proportion of these three types of hair giving them their distinct coat types. Moulting will occur, to some extent, all year round and grooming helps to remove the loose hair, much of which is be swallowed. Such hair becomes impacted and either passes through the cat’s digestive system or is vomited up as a hairball.Their bodies are incredibly supple and can bend and flex to enable them to reach all parts with ease. The cat’s tongue is covered with backward-pointing spines, perfectly designed to groom coats effectively, removing loose hair and dirt. When you first acquire a kitten you should get it accustomed to being groomed from a very early age. Gradually build up the amount of time you spend grooming your kitten until it is quite happy to allow you to brush it. Eventually a lot of kittens may enjoy being groomed all over and will come to see it as part of its daily routine. To begin with, some kittens and also adult cats may be much more tolerant to be handled and groomed than others, and it is important that grooming and (most importantly) general handling tolerance is built up gradually, without it being a negative experience for either you or the cat. A cat should never be ‘forcibly’ groomed or stroked without the option to escape if they are finding the experience stressful. When, as a kitten, your cat is used to being handled it makes it easier for the veterinary surgeon to carry out an examination and the experience will be a lot less stressful for your cat. Your cat will know what to expect and there will be no nasty surprises. You will need some equipment, such as a fine-toothed flea/tick comb, a bristle brush, a rubber grooming pad or a mitten. Always begin your grooming session when your cat is relaxed and happy. Plan to groom your cat at least once a week, using the flea comb first to check for flea excreta (tiny black comma-shaped dirt that runs red if a drop of water is added to it). If you find any, speak to your veterinary surgeon about effective flea control. You can use your fingers to loosen the dead hairs in your cat’s coat by massaging against the hair growth in the direction of its head. Gently brush or comb your cat’s hair, using strokes towards the tail starting from the head region, in the direction that the hair grows. Use the bristle brush to sweep up the coat in the direction of the head if your cat will tolerate it, and then smooth it down again (many cats might not like this bit if they are not used to being brushed in this way, and some may just find the sensation too unpleasant). This will bring all the loose hairs to the surface so that you can then use the rubber grooming glove or pad from head to tail, removing dead hair and stimulating the blood supply to the skin. Any loose hairs lying on the surface of the coat can be removed with a damp cotton or rubber glove to produce the final glossy finish. These sessions should be as short or long as the cat is comfortable with, and should be ended before the cat shows any signs of discomfort. They should also aim to finish on a positive note, with treats and praise. The equipment you will need should include a wide-toothed comb and a rubber mitten or pad. Longhaired cats need to be groomed at least once a day but careful attention should be paid to the current tolerance level of the cat and time spent grooming should not exceed this. Again, as for short haired cats, always choose a time when your cat is relaxed and happy to begin grooming. Massage the skin thoroughly before grooming commences by gently rubbing with your fingers against the hair growth from tail to head. As the hair is lifted check for flea excreta (see above). Using the wide-toothed comb, groom from head to tail to remove dead hair and take particular care with areas under your cat’s ‘armpits’ and between its hind legs, as the skin is very thin here and extremely sensitive. It is also an area of friction where knots are common. If you do come across a knot (known as a matt), tease it apart gently using your fingers. This needs patience as you work slowly from the root towards the end of the hair. Don’t be tempted to use scissors; it is extremely difficult to see where the skin ends and the hair starts when it gets really matted and you will inevitably cut your cat at some point. Another common area where matts can form is between the toes and pads, so check each time you groom and tease out any accumulated debris gently. Once this process is completed, use the rubber mitten or pad to remove more dead hair and do a final sweep over the coat with a damp cotton or rubber glove to remove any loose hairs that remain. 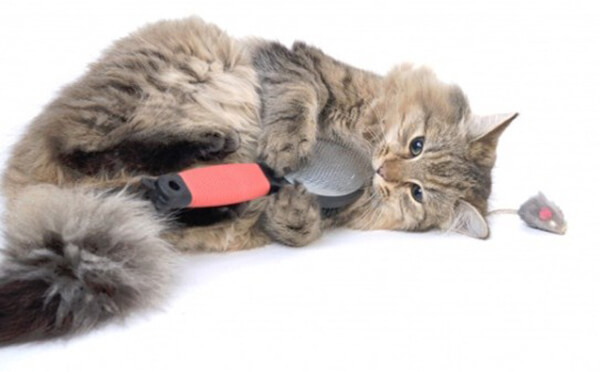 Finish off with the comb if your cat is being patient and enjoying the attention. If grooming is a struggle, it should be stopped. Start again at a time when your cat is relaxed and aim to have smaller goals for each grooming session, these being goals that your cat can easily tolerate. Always reward relaxed behaviour with praise and food treats throughout the grooming sessions. There are numerous grooming products on the market, particularly for longhaired cats, for example rakes, slickers and detangle sprays, many of which claim to make grooming as simple and safe as possible. What works for you and your cat can be a very personal thing so it’s worth investing in a range of equipment until you find the combination that does the job and causes the least amount of stress for all concerned. Through daily grooming, cats should not become matted. Preventative grooming is key. However, if a cat comes into your care that exhibits matts, it is important to remember that these can be extremely uncomfortable (put a clump of your hair in a tight elastic band that constantly pulls at the scalp and you will an idea of what this feels like). You may find a professional cat groomer who would still be able to groom manually but most severe matts need to be shaved off by your vet. This will require at the very least sedation but, in reality, it is usually done under general anaesthetic. You will then find that your cat will end up with fur on his tail, head and lower legs and nowhere else until it all grows back. If your cat is healthy there is no reason to give your cat a bath. Most do not tolerate it well. The following are some of the more subtle indications that the cat may be feeling uncomfortable. Interaction should be stopped when any of these signs are visible.